Firefox, like any other web browser, offers options to zoom in or out of a web page temporarily which can be useful if a website uses fonts that are either to large or to small. Another use for it is to increase the font size if high-definition displays are used. Two of the biggest complaints about Firefox's zooming feature are the inabilities to save zoom levels for future browsing sessions and to set a custom zoom level for individual websites by default. Default FullZoom Level is a handy add-on for Firefox 3.6 and later that offers to resolve both issues and more. Its first feature is the option to set a specific default zoom level. Users who want bigger fonts for instance can increase the zoom level to 125 or 150, or any percentage value in between. The opposite is possible as well, any number below 100 would make the font on the screen smaller. The effect is immediate and valid for all web pages in the browser. Even better, the zoom level is automatically set to the selected value on every start of the browser. This means that you can set a different default zoom level from Firefox's default display without ever having to worry again that it will be reset. Another bonus: Default FullZoom Level remembers site specific zoom levels which makes it useful even for Firefox users who do not want to change the default zoom level for all websites. Users just need to change the zoom level on an individual web page (for instance by using Ctrl-mousewheel or Ctrl- or Ctrl+) to make the changed zoom level the default from then on. The browser remembers all custom zoom levels that you have set in it, so that sites will always be displayed in that level when you open them. The same is possible for locally saved files. Changing the default zoom level and setting custom zoom levels for specific websites is already very useful, but the extension offers additional features that may be interesting for some users. 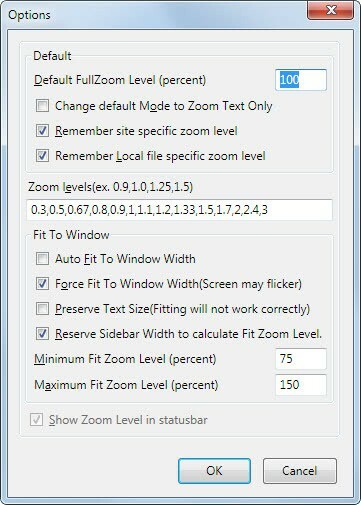 The Fit To Windows options can be used to automatically fit the zoom level to the open window with options to define a minimum and maximum zoom level automatically. Default FullZoom Level is a handy Firefox extension for users who regularly use the zoom feature in the browser or wish that the browser had an option to set a new default zoom level. I think NoSquint is a better add-on for this purpose. Enter about:config in the location bar to access the advanced preferences. Look for extensions.browser.zoom.fullZoom.default and edit the ‘value;’ 100 for 100 percent zoom.